Martha Berry requests that when the Garden Club of America comes to Atlanta they spend a day at Berry. She notes the grounds are well kept and her old colonial house with beautiful gardens and wonderful hedges of boxwood are worth seeing. Berry indicates the roads are well paved all the way from Atlanta. Miss Martha Berry, “Letter to Mrs. Wm. 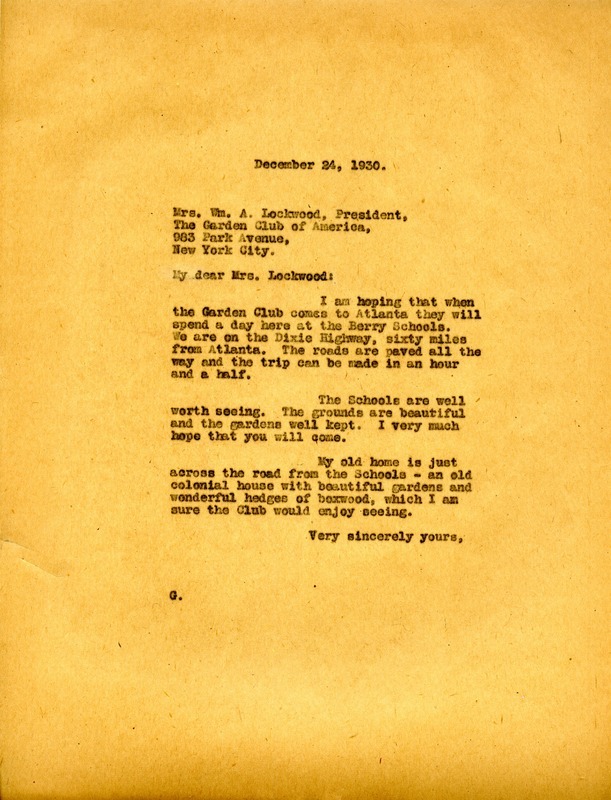 A. Lockwood, President from Martha Berry.” Martha Berry Digital Archive. Eds. Schlitz, Stephanie A., Rachel Renaud, Claudette Bearden, et al. Mount Berry: Berry College, 2013. accessed April 24, 2019, https://mbda.berry.edu/items/show/12598.